Steaks and dishes with international flair shape the menu at this Buckhead restaurant. 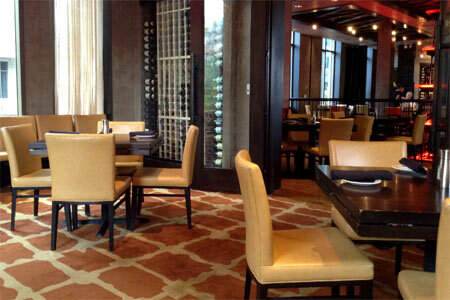 : Del Frisco's Grille’s interior showcases a large central bar with individual seating and flat-screen TVs. The second-floor dining room features generous windows and tall orange-red lamp shades cascading from the ceiling, adding a splash of vibrant color to an otherwise neutral palette. Popular steak-and-cheese spring rolls, crunchy and very rich, make a fine bar nosh. The menu focuses on steak, but adds regional notes in the deviled eggs made more toothsome with the addition of truffle-chive vinaigrette. Buffalo wing lollipops are just right in the spice department, and the avocado ranch makes an intriguing alternative to the usual blue cheese dressing. We also liked the perfectly cooked flounder, topped with salad and just a dab of crab meat. Flavorful steaks come as ordered, but may be over-salted, so consider specifying that less be used. Share the huge portion of coconut cream pie with white chocolate shavings or enjoy the butterscotch custard all by yourself. The wine list offers a wide range of selections, although they are largely from California with other regions contributing here and there. By-the-glass choices are fine; half-bottles are available as well, and so are dessert wines. Insider tip: Wheelchair access to the upstairs dining room is via elevator.